9. Our Way to Fight enters the world! As of January 20, Our Way to Fight will be available for purchase in Canada from select bookstores and online from the publisher, Between the Lines. In the UK and Ireland you can now order the book online from Pluto Press. By January 20 it will be available at select bookstores in the UK and Ireland. If you don’t find it at your favourite bookshop, please request that they order a copy (or two…) This will bring the book to their attention and may lead them to stock more copies! Soon I’ll start posting updates on this blog about some of the brave people featured in the book. Doing this will give me an opportunity I haven’t had with any previous book – to continue documenting lives/stories that would otherwise appear to go silent when the book is closed. The Israel-Palestine situation evolves so swiftly, and with such enormous repercussions, it begs for an open book. This book emerges from a journey and a search, to see what grounds for a just peace I could find in the tormented land that many call holy. In a world of spin where ‘peace’ can mean anything, including war, it’s essential to specify: a just peace. Peace without justice is hollow, a sham, the deathly stillness of tyranny triumphant. By contrast, a just peace is alive, clamourous, and vibrant with risks and possibilities. Of course in a world of spin, ‘justice’ can mean anything too. This book explores what a truly just peace might look like, and how people imagine building it in Israel-Palestine. Our Way to Fight offers no solutions, only stories of extra/ordinary people fighting fiercely for such a peace, on whichever side of the wall they happen to have landed by accidents of birth. 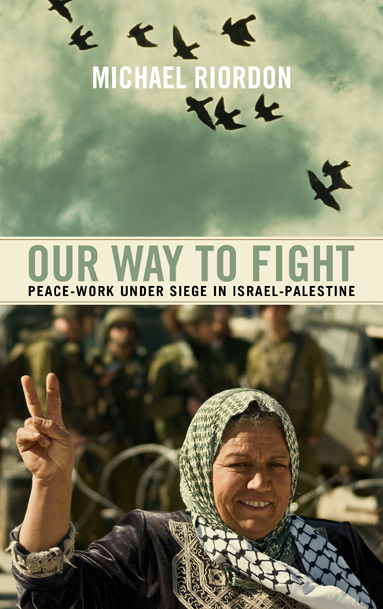 “Our Way to Fight explores the stories of men and women who create glimmers of light and hope in the dark despair surrounding the Israeli-Palestinian conflict. A close look at activists who dedicate their lives to the struggle for social justice, Michael Riordon’s portraits reveal what it means to be a courageous person, a seeker of truth. This is a vital intervention for all who care about peace and justice.” Neve Gordon, author of Israel’s Occupation.